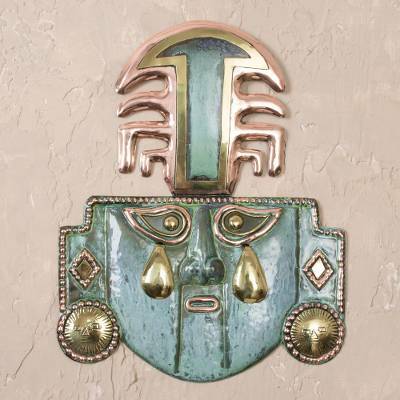 Peruvian Archaeological Bronze and Copper Mask, "Tears of a God"
Ai Aepec, the supreme god of the Moche people, sheds two solitary tears; his face is stern and fearsome. The gesture expresses Ai Aepec's divine sensibility. Ana Maria Enciso invokes the presence of the powerful deity as she creates this extraordinary mask. She crafts the mask of copper and bronze and treats the face to a galvanized bath to achieve the distinct green finish. Ana Maria Enciso has received 7 microcredit loans with 0% interest from Kiva and Novica, the first for $850 and the most recent for $600. Proceeds were used to buy copper and bronze to continue crafting her designs.